On April 8 the sittings of NA Standing Committees were held. 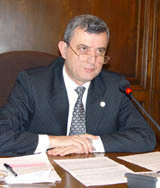 During the sitting of NA Standing Committee on Foreign Relations headed by Armen Roustamyan, they discussed and made a positive decision on including into the four-day draft agenda of April 11-14 the agreement signed on July 13, 2004 in Moscow “On Cooperation in the Sphere of Education between RA Ministry of Education and Science and Ministry of Education and Science of the Russian Federation” which presented Norik Ghukasyan, Vice-Minister of Education and Science. Hayk Darbinyan, Vice-Minister of Health Care, presented the agreement “On Cooperation in the Sphere of Health Care and Medicine between RA Government and the Government of Cyprus” sign on July 5, 2004 in Nicosia, which will be presented for ratification of the Parliament during the coming four-day sittings. During the sitting of NA Standing Committee on State and Legal Affairs, headed by Rafik Petrosyan, Committee Chairman, six legislative initiatives were discussed that gained the positive conclusion of the committee. 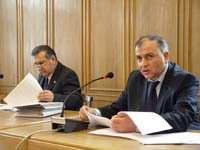 Ararat Mahtesyan, Deputy Head of RA Police, presented for the first reading the package of draft laws “On Making Amendments and Additions to RA Codes “On the State Register of RA Population” and “On Administrative Offences.” Emanating from the amendments in RA law “On the State Register of RA Population” it is suggested envisaging administrative liability for the breach of the rules of calculation in the register and to raise the amount of fines. They discussed the draft law “On the Tariffs of Calculating the Size of Reimbursement of the Damage Caused to the Flora and Fauna in the Result of Ecological Infringements” in the second reading. The discussed draft laws will be included into the agenda of the coming NA four-day sittings. During the sitting of NA Standing Committee on Social Affairs, Health Care and Environment, headed by Gagik Mkheyan, they discussed the amendments and additions to RA law “On Child’s Rights,” which was submitted by “People’s Deputy” group. Hakob Hakobyan, MP, presenting them said that the aim of the amendments is to support the raise of birth rate. Aghvan Vardanyan, Minister of Labour and Social Affairs, informed that today 10.405 families having 4 and more children receive aid from the family benefit system. According to the Minister, the experience shows that these kinds of privileges do not support the raise of birth rate. The issue was included into the big agenda with the positive conclusion of the committee. The Government submitted to NA discussion the draft law “On Allocating on Ownership Right to the Refugees the Flats Built for the Refugees Emigrated from Azerbaijan in 1988-1992.”As Gagik Yeganyan, Head of the Department on Refugees and Migration adjunct to the Government, informed that, according to the law adopted in 2002, the flats and cottages built for the refugees were provided to the refugees on uncompensated ownership right. During that period 300 families that were out of city, couldn’t manage the appropriate tasks and remained out of the process. It is suggested prolonging the period of activity of the law. And if during that period there would still be families remaining out of the process, the flats would remain under the subordination of the state. Considering that the issue is serious and demands a legislative solution, the members of the committee decided to include the issue into the big and four-day sitting agenda with an endorsement. The agenda of the sitting of NAStanding Committee on Finance-Credit, Budgetary and Economic Affairs, presided by Gagik Minasyan, was full. It was suggested including into the agenda of the session 8 and 14 issues on the agenda of coming four-day sittings. After long discussions and disputes among the MPs and the representatives of the Government, the committee adopted a decision on giving a positive conclusion to making amendments to the law “On the Protection of Economic Competition” which was proposed by the executive body. MP Vahram Baghdasryan’s suggestion on making amendment to the law “On Simplified Tax,” both the MPs and the representative of the Government were for it during the discussions. The amendment to the law “On the Child’s Rights” submitted by the members of “People’s Deputy” group, they try to encourage the natural growth of the population envisaging monetary assistance for the fourth or more than fourth each children. Hakob Hakobyan, co-author of the draft, presented that according to the official data 800.000 citizens left the republic for the last years in the result of the emigration and their medium age is 30. The Government is against this legislative initiative grounding that 14 thousand out of 31.000 families having many children of the republic are stated and 10.000 are already included in the system of family benefit. In the contrary, the executive body is ready to discuss with MPs the amount of the benefit given to this social group. The Government was also against the draft law initiated by Vahram Baghdasaryan, on making addition to RA Land Code. And till then the draft will be included into the agenda of the session with an endorsement. The drafts envisaging amendments to the laws on “RA Budget System” and “On Local Self-Government Bodies” submitted by the Government were also on the agenda of the sitting. All the documents discussed deserved the approval of the committee.